Which takes more (irrational?) faith to believe; that the universe was created, or that it all started with a 'big bang'. I mean, what 'banged' - nothingness, space, cosmic goo, what? It is easy to knock creationism, but not very clever, actually. Whether one chooses to be religious or not, the fact remains that the answer to the basic questions is; we just don't (can't) know. We simply choose to believe what we are able to rationalise. So you too, my friend, are a believer. (And that goes for Olly too). I like the picture but I would have written "people" instead of primitive which sounds insulting and kind of spoil the joke. My daughter asked me the other day how the animals were created.I told her that some believe it was God and some believe it started from cells but nobody knows. I told her that when she is older she can make her own mind up. Even if there is a creator who made the universe, there is so much evidence that life forms on the planet are more the product of continuous adaptation (read evolution) than the work of a one-time creator. The Bible, like most other holy books is a work of allegory and anyone taking it literally misses the point. There was no Adam, no Eve, no Garden of Eden, no Noah, no sun standing still for three days, no Jonah in the belly of the whale and hard as it may sound, no resurrection of Jesus from the dead. Religious traditions from the present day Middle East and Greco-Roman world were all so similar. That is why stories of an Adam and an Eve are found not only in Christianity but also in Islam and some forms of Hinduism and lots of other religions in Asia minor. That is also why the story of Jesus looks so similar to those of Mithras of Persia and other saviours (born of a virgin woman, had 12 main followers, baptized at 30, instituted the Eucharist, died for the sins of the world, resurrected from the dead and will come to judge the living and the dead). You are quite right in stating that “we do not know”, but it is better to err on the side of limited knowledge than to rely on a book purportedly written by educated herdsmen and fishermen claiming to be the “Word of God”. Astrotheology reveals to us the true meaning of some of the allegorical statements we find in the Bible. The continuous recurrence of the numbers 12 (the signs of the Zodiac), 30 (the degree between two Zodiac signs) and 3 (the number of days the sun vanishes or “dies” in the Northern hemisphere) for example. Thus we see 12 tribes of Israel, 12 sons of Jacob, 12 apostles of Jesus, Jesus in the temple at age 12, 144,000 chosen people in Revelations (a multiple of twelve), Jonah in the belly of the whale for 3 days, Jesus dying for 3 days, the sun standing still for 3 days at Joshua’s command—all clearly allegorical. If you think all this is nonesene, why then, in the Gospel of John, does the author (likely a philosophical mathematician well schooled in Greek philosophy) refer to the catch of fish as being exactly? Simple. 153 is the number of the fish or Vesica Pisces—something a mathematician would know about. It is okay for us to be religious but we ought not to be blind to the fact that what some of us call the "Word of God" is nothing more than a collection of the thoughts of people who lived thousands of years ago. I agree with you, broadly. Your speculation on the commonality between Judeo-Christian traditions and other Middle eastern traditions is interesting. It is however just that - speculation. 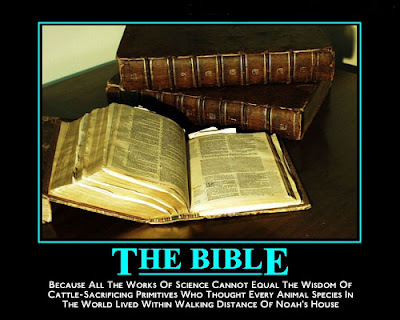 Therefore it is also just possible that the Bible is indeed the Word of God. As Sandrine noted, it is wrong to sneeringly dismiss the Bible (or any other religion/tradition) out of hand. Each to his own. You are right that the physical evidence does seem to point to an evolutionary process. However the Bible does not contradict evolution and does not necessarily point to a 6,000 year old earth (as many Christians seem to believe). After creating Adam and Eve God tells them to 'replenish' the earth. 'Replenish' seems to imply there had been some sort of previous population (dinosaurs? ), which may have been wiped out. So I don't think it is necessarily a simple choice between a one-time creator and a continuous process. Maybe its both?! PS: I love the way Jeremy has neatly steered us away from the more controversial (and juicy) Nija political topics (now, that's what I call blog-evolution), by introducing a more mundane, pointless and inconclusive topic. Very clever - straight out of 'A Young Persons Guide to Philosophy'!! I’m not in agreement with your statement that the relationship between Judeo-Christian and other Middle Eastern traditions is simply based on speculation. Far from it! Judaism and Christianity (and all other religions) did not fall from the sky. They evolved from earlier human thought processes and philosophies. And some of the earliest civilizations can be found in the present day Middle East, precisely where the Judeo-Christian-Islamic faiths have their roots. Take your time to study other Middle Eastern/Asia minor religions in depth and you will be amazed at the similarities between them and Christianity/Islam. It cannot be coincidence. Some of these religions are much older than Christianity, which means that Christianity likely borrowed from them. The Bible is a nice book. It teaches—to some extent—morality and guidance. But it was not revealed by a Deity. It was written by inspired men and maybe women, like all other books. These men and women based their values on the understanding of their time. Going through the Bible, one is able to capture a perfect evolutionary process in theology. We begin with Yahweh, a tribalistic God, who loves the Hebrews and hates other people. This God later evolves to become the Father of Jesus Christ who surprisingly loves all people. How strange! In reality, God never evolved. It was human understanding of the nature of God that evolved, hence the transformation from the vengeful and unpleasant Yahweh to the loving and kind God the Father. The Bible is a compilation of Jewish/Christian understanding of a Deity over centuries. Thus, while it was okay to stone someone to death for adultery in the Old Testament, the New Testament is filled with nothing but love, love, love. Same God? Then why such different laws? Sounds rather Aristotelian doesn’t it? It sure does, because the Gospels are most likely nothing but personified forms of mystical stories that existed long before they were written. Replace Mithras, Horus or Krishna with Jesus. Modify the theme a bit and change the setting from India or Egypt to Palestine, and you have a perfect story. Of course, the story has to be set to real history, so you choose as the time when Palestine was under Roman occupation. Once in a while you mess up so much with history, like asserting that Herod the Great existed at the same time as Caesar Augustus (according to Matthew’s Gospel) because your story isn’t based on facts but on ancient myths. Let those who are interested study history and other religions and find things out for themselves. And mind you I am in principle a “Christian” because Christianity preaches love and peace. But I do not subscribe to dogmatic theology based on a “Word of God”. Okaka - great comments. I've long regarded Pauline Christianity as an utter bastardisation of the core Christian message of love thy neighbour. Paul span the story out of kink so the Romans would buy. And buy they did. However you digress from the point - creationism vs evolution. If you accept the 'miracle' (because that it what it amounts to) of the Big Bang, why can't you accept the miracle of the Bible? Surely a God that created the universe should also have the gumption to deliver his Word to us through the agency of inspired (your word) human beings. Of course this Word would be informed by their education and historical context. Given that both creationists and evolutionists all believe in miracles, what's your basis for defending your take on the miraculous over another persons? You are right that I digressed from the topic at hand—evolution versus creationism. But I hope I made my points known on issues that resonate along a similar line. Sometimes, I feel arguments or debates on issues such as ‘Evolution or Creation’ provide little room for intellectual insight because opposing sides all too often hold strongly onto their views. However, I have this to say. The Bible is not a book but a collection of very different books. It was the Roman Catholic Church that decided which books ought to be or not be included in the Bible from the myriad of books it had in the 4th century. It was also the Roman Catholic Church that first declared the Bible to be Deo Verbum (the Word of God). The Roman Catholic Church continued altering which books could or could not be in the Bible up to the 16th century, when the Council of Trent was held. Most people who read the Bible today haven’t a clue as to its origin. Today, Protestants, Catholics and Orthodox Christians cannot even agree as to how many books there are in the Bible. The Catholics have 73, while Protestants have 66. The only authority the Bible has is from the institution that first gave it to the world and that institution is the Roman Catholic Church, itself a product of the Roman Empire. I do not see anything miraculous about an institution (the Roman Church) presenting a collection of books to the world, which it (the institution) claims to be the Word of God. Even though Protestants and non-Catholic Christians may disagree fundamentally with the Roman Church today, the fact remains that the Bible they use is a Catholic product and the only authority the Bible has is that it comes from the Roman Church (the Old Testament was by the way borrowed from the Judaism). I do not see anything miraculous about the Bible any more than I see the Koran or the Vedas to be miraculous revelations (I have deep respect for most religious traditions). The only reason people believe the Bible or Koran to be revelations from a Deity is because they are taught so. I have a Bible which I read quite often as I have always done from childhood. But I do not read it as the Word of a Deity. No, I read it as a book that contains the thoughts and stories of people who lived hundreds of years before me. The ‘Word of God’ is simple. Be nice to your neighbours, help those in need and love all around you. Learn to forgive and live in peace. These are fundamental rules of ‘survival’, for in essence being good is doing what enhances the survival of the human specie, other animal life and planet as a whole. Such is the way of ‘salvation’. For even when the human race moves to Mars or other worlds, these fundamental rules will remain. As for the Bible? I’m not so sure. With regard to Jeremy’s comments, I totally agree about Paul’s ‘bastardization’ of the core Christian message of love. Unfortunately, Christianity has always appeared more Pauline than of Jesus. I concur sha...with the pic that is. So you can be in agreement with Christopher Hitchens on something then!